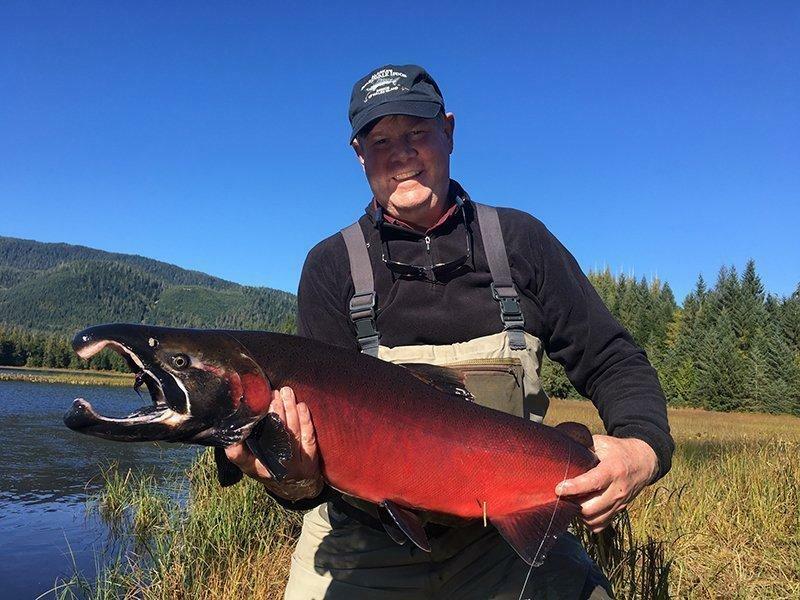 Freshwater fishing — both spin casting and fly fishing — at Alaska’s Boardwalk Lodge is world-class in nearby rivers, lakes and streams, with easy access to 23 select waterways on breathtaking Prince of Wales Island, Alaska. Many of these neighboring waters are only fished when Boardwalk Lodge guests venture out, allowing you to cast and catch in solitude. The Island’s largest river, The Thorne, is just up the road from the lodge property on Thorne Bay. Freshwater fishing trips are easily accessed on the Island with our fleet of Suburbans. While this makes fly-out trips completely unnecessary, we do make fly-outs available for an additional cost. Use of the lodge’s premium Lamiglas® rods, Shimano® reels, Orvis® waders and wading boots, and wet weather gear is included in your lodge package. We supply you with a wide range of equipment to fit the conditions and to meet your needs. Yet, while our equipment and tackle is all-inclusive to your stay, you may find helpful information below for packing along the time-tested freshwater fishing gear you just can’t do without. Imagine catching wild Steelhead — Alaska’s sea run Rainbow Trout – not hatchery fish. Southeast Alaska’s trophy-class lunkers are typically in the 29-37 inch range on Prince of Wales Island! These are powerful, fierce fighters that will have your rod pulsing and straining to meet the water. Alaska’s Boardwalk Lodge accommodates hearty Steelheaders looking to land some of these rare, trophy Steelies during peak Steelhead fishing from April 1 through May 10. For spin casting, we recommend a 7-8 foot medium rod with a medium weight reel. Good lures are egg imitators and #2-3 Mepps Aglia (fluorescent red or gold). Dolly Varden and Cutthroat Trout are plentiful in nearby lakes and streams, providing year-round excitement. Most Cutthroat and Dollies range from 10-21 inches. These tenacious trout and char leave no shortage of action – you may find yourself catching and releasing till your arms give out! Recommendations for successful trout fishing on the Island include a light action rod and reel, with an assortment of spinners (size 0-3), jigs and spoons (size 1/8 oz.). Non-stop battles heat up in July with Coho and Sockeye Salmon runs, followed by a sea of Pink and Chum Salmon in August. The vast majority of these fish have never seen an artificial lure, much less taken one. Both skilled and novice fisherman will need to brace themselves for the thrill of a lifetime when these trophy Salmon hit. The fight is non-stop and the sheer rod-bending action is exhilarating! Silvers, or Coho salmon, are hard fighters and can provide intense action. The Coho average 12-15 pounds, but can be found weighing in at over 20 pounds. These salmon are most plentiful from late July through September. Southeast Alaska’s Coho Salmon fishing is best approached with a heavy action rod and reel. Popular lures include #3 and #4 Blue Fox Vibrax spinners (silver, orange and green), 1/4 and 1/2 oz. Blue Fox Pixie spoons (orange and green), and various Mepps spinners in sizes 3 and 4. These are the smallest and most abundant salmon in area waters. Pinks have a two-year life cycle and average 3-5 pounds. Upon entering freshwater streams, pinks develop a dorsal hump, thus their nickname “Humpy.” Saltwater Humpy fishing is best during July and August. Spin casting gear for Pink Salmon should consist of a light action rod and reel. Popular lures include #3 and #4 Blue Fox Vibrax spinners (silver, orange and green), 1/4 and 1/2 oz. Blue Fox Pixie spoons (orange and green), and various Mepps spinners in sizes 3 and 4. Often called Dog salmon, Chums are famous for their strength and large teeth, which develop most prominently in males upon entering fresh water. 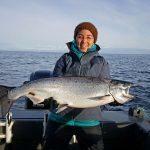 Chum salmon fishing is readily available mid-July through August. These salmon average 15 pounds with an occasional lunker topping 25 pounds. Standard fishing gear for Dog Salmon mirrors that of Coho Salmon: heavy action rods and reels. Popular lures include #3 and #4 Blue Fox Vibrax spinners (silver, orange and green), 1/4 and 1/2 oz. Blue Fox Pixie spoons (orange and green), and various Mepps spinners in sizes 3 and 4. Also called Red salmon, Sockeyes are the most difficult salmon to catch in area waters. Frequently bare red hooks – this is no fish tale! – are among the best lures to attract these wary salmon. When the bite is on, Red Salmon are highly regarded for their fighting skill. Heavy action gear is essential to combat the explosive runs these salmon take. Adventure is never in short supply at Boardwalk. When your casting arm grows tired, toss in a line aboard one of Boardwalk’s 26- and 27-foot heated cabin cruisers. Saltwater fishing excursions run daily.